Here are resources to teach cartooning, including info about our new book, Fast and Easy Cartooning for Fun, reader-submitted activities and classroom teaching tips, and online resources. You are invited to share your experiences! This site is live! The best resources are edited and copied to the Fast and Easy Cartooning for Fun Activities and Links pages. The site is sponsored by Robert Gluckson, educator and cartooning instructor, and author of the Fast and Easy Cartooning for Fun! Handbook. See all the mass media online resources at www.vizcom.info, including history, business, and career sites for advertising, books, movies, radio, and TV. 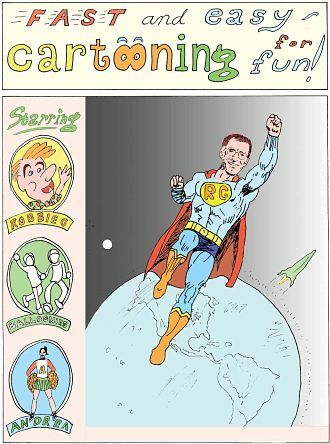 Teach Cartooning with the Fast and Easy Cartooning for Fun! Handbook. The Fast and Easy Cartooning for Fun! handbook presents games and skill-building lessons, illustrated with examples by students, the author, and professional cartoonists. The book alternates art games with see–and-do skills acquisition activities. Students quickly develop the ability to draw funny faces, move bodies through space, and tell multi-panel stories. The detailed lessons and lesson plans enable teachers to incorporate cartooning into their lesson plans. Professional cartoonists can make more money teaching cartooning! Based on twelve years of cartooning workshops, author/instructor Robert Gluckson has a Master’s degree, in Popular Culture! Buy Fast and Easy Cartooning for Fun! at www.teachcartooning.com/buy.html. The Ebook is $5 and the 66 page magazine-size printed book is $12 plus $3 postage and handling. • Draw anything found on the internet or in the library. Contact Site Administrator Robert Gluckson at robert@teachcartooning.com. It’s fitting to honor one of my favorite artists and a leader in the comic book/cartooning education. While primarily an on-campus training facility, the $325 correspondence course is worth exploring.